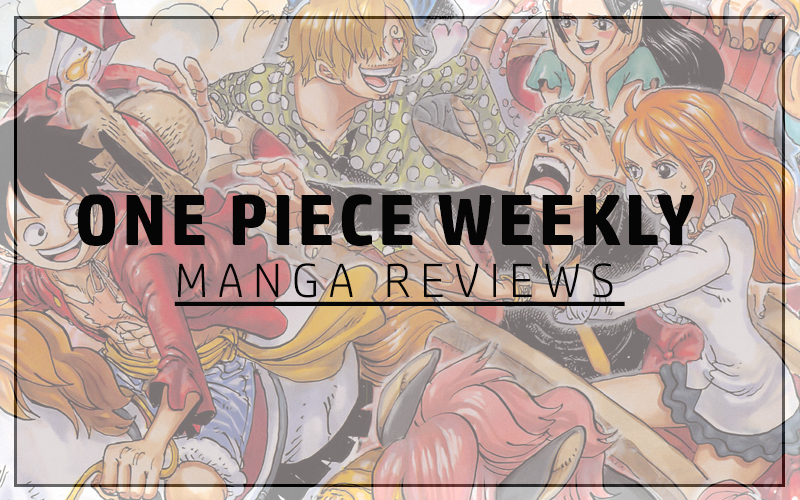 The One Piece Chapter this week was pretty awesome indeed. 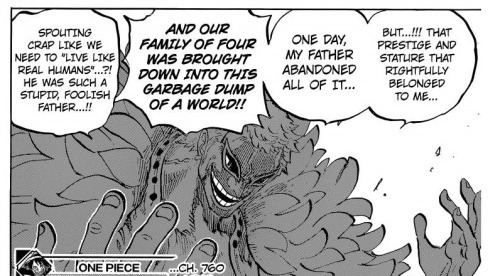 We get an insight into Doflamingo himself and the truth to his past. Despite not the tragedy that one would consider fathomable, considering what some of the Straw-Hats have had to endure; it was a tragedy non-the-less. Poor little Doffy had to accept his father’s decision to dishonour the family by renouncing all claims to god-ship. The former Celestial Dragons were to live like normal humans which caused something to snap in the young and already wicked mind of Donquixote Doflamingo. It wasn’t until his mother died that he decided to take action. 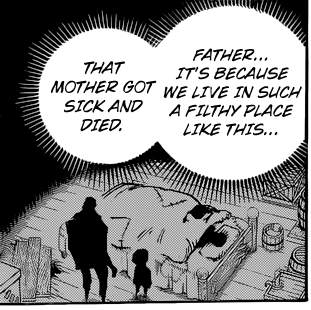 Blaming his father for the death, Doflamingo murdered the man that had raised him; cleansing his bloodline of the filth. However, the remaining Celestial Dragon Families refused to accept the head of the traitor as compensation for allowing Doflamingo to re-attain his position amongst them. Ever since, the former Tenryubito has been causing havoc across the seas trying to take control over all the lands that belong to the Celestial Dragons. Can you believe it…? His actual targets are the Celestial Dragons themselves. Had he gone about this the right way, he could even be considered an anti-hero. Some may have predicted something along these lines but this was a revelation for me. 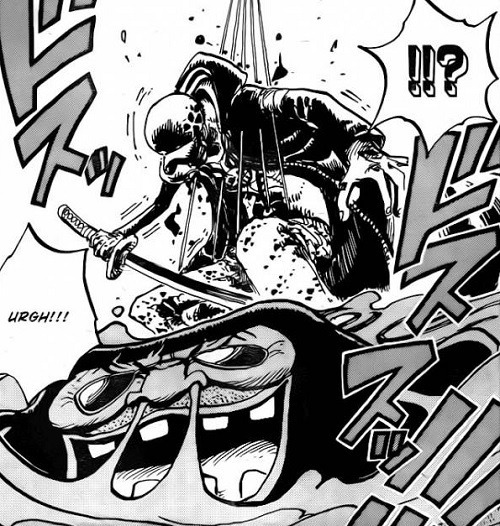 As for what is happening in the present… Luffy and Law are struggling against this awfully strong villainous figure. Not only is he ruthless, he is also a narcissistic douche-bag. However he does care for his subordinates. Law was wiping the floor with Trebol but Doflamingo had to intervene. I don’t think killing Luffy and Law will be enough. I think he feels the need to make an example of them. He needs to make an example of what happens when you go against Doflamingo. I think he’s planning to execute all those who went against him. This is going to be interesting. I don’t see how he can be stopped. 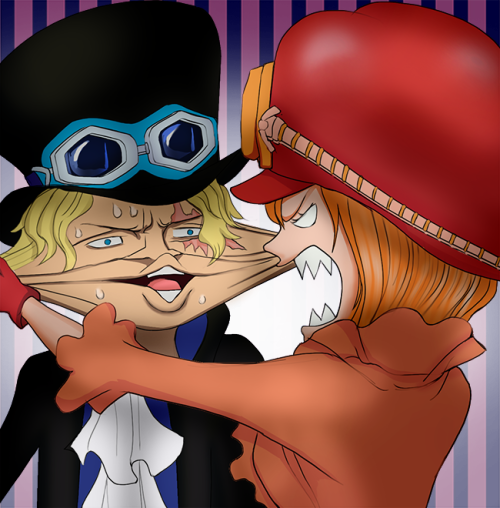 Elsewhere, it was interesting to see the friendly chemistry between Sabo and Koala. I bet everybody is already shipping them now. They do make a cute couple I must admit. King Riku and Fujitora also spoke of peace and war. They both don’t want a war to happen but from where I stand, it’s already begun. But I guess they don’t want the citizens to fall prey to Doflamingo so they’re both counting on Luffy to come out on top. Hence the both of them are making the same bet. This is interesting because Fujitora is a gambler who is known to always be correct. So Luffy should win. Right?